It’s Chicago Marathon weekend, or as I refer to it, Christmas, and it’s a gigantic weekend! Not just for runners who are participating, but for the millions of Chicago residents that come out to line 26.2 miles of streets to cheer, and for the city as a whole in tourism. In fact, in 2014 the Bank of America Chicago Marathon brought $254 million in business impact to the city! “Motorists should be aware that some street and lane closures are already in place in the Grant Park area, including Balbo from Columbus to Lake Shore Drive. “Additional street closures in the race day start/finish line area can be expected thereafter, beginning on Wednesday when Jackson will be closed from Columbus to Lake Shore Drive. Columbus closures begin Thursday, with a full closure implemented from Roosevelt Road to Monroe By Friday. Closures that are in place as of the morning of Thursday, October 8th with future closures illustrated. 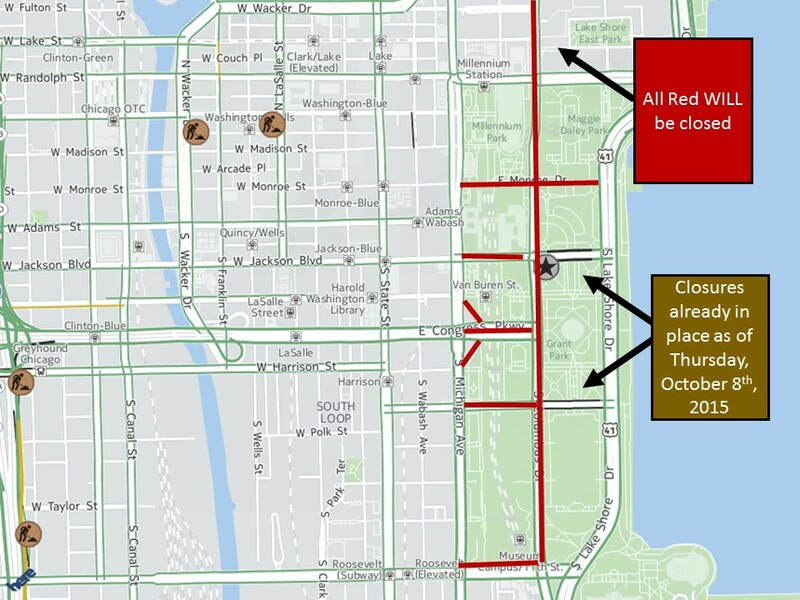 “By Saturday, expect additional Grant Park street closures on Columbus, Balbo, Congress, Jackson and Monroe, with most streets in Grant Park reopening by Monday morning. The entire Chicago Marathon Course. Closures begin SATURDAY AFTERNOON, so do not park on any of these streets. All vehicles WILL be towed, not just ticketed. For some Chicago residents (such as a 2006 version of myself), the marathon can be a bit of a headache with the street closures and ample street parking that is abruptly taken away…along with our cars. No, it hasn’t happened to me, but I’ve seen the ugly. In addition to a ticket, you get to take a ride to one of the city’s lovely impound lots. My favorite is at Lower Wacker Drive, where you get to stand in line and pay $150 for the towing fee, $20 per day for storage, plus the ticket that is attached to your window after they let you into the yard to embarrassingly hop in your car and drive off. 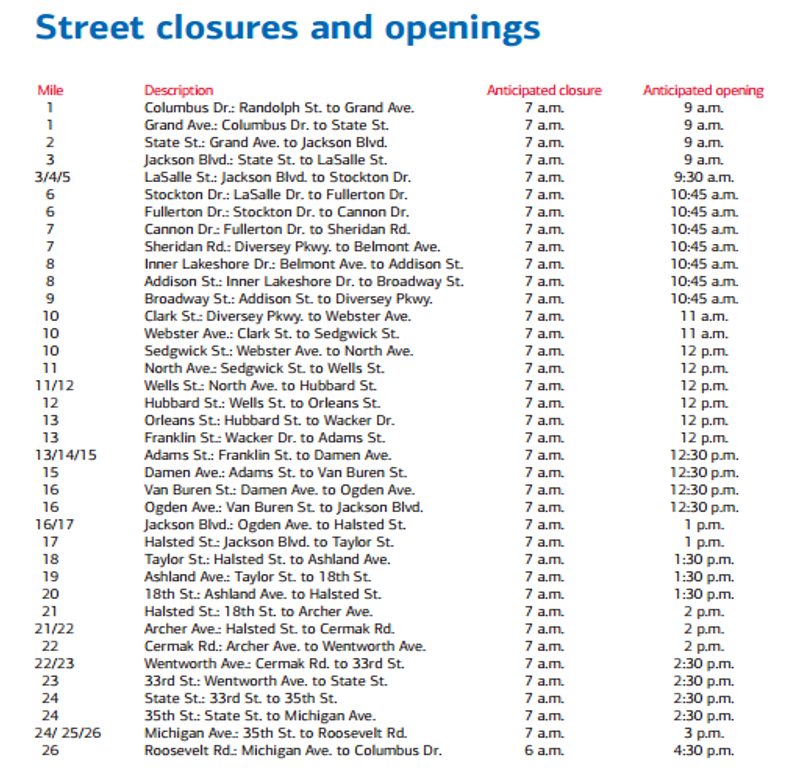 Exact street closure locations and times with anticipated re-opening. Plan accordingly. As always, the CTA adds cars to many of the L trains and have them run more frequently on Marathon Sunday than other weekends. The best bet is to purchase a one-day Ventra pass for $10. These can be purchased at most Walgreens in the city of Chicago. Otherwise, you are able to purchase a Ventra card and load however much money that you wish at most L train stations. Keep in mind that each train ride is $2.50 and $2.25 for a bus ride. You may still pay in cash on buses. Thank u. I’m visiting Chicago n what a terrible weekend to do so. We have a flight out on Sunday evening! Actually, it’s a pretty amazing weekend with an incredible event. You’re lucky you get to experience it. The streets will be re-opened by 9am on Sunday morning in that neighborhood. Ty! The hotel says it will be closed till 4 pm!